Hotel Dolomiti is set in the historic centre of Malcesine, 300 metres from Malcesine Castle and close to the cable car to Mount Baldo. It offers a sun terrace with swimming pool and mountain views. All rooms come in a modern style, with parquet floors and air conditioning. Each room features a private bathroom with a shower. Some are complete with a balcony or terrace. Dolomiti Hotel is just 50 metres from the nearest bus stop, with links to Verona, Brescia, and Venice. 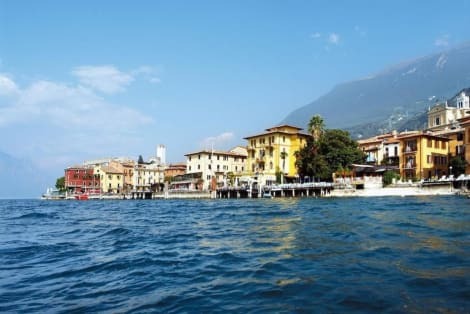 The closest public parking is 100 metres away, and the shores of Lake Garda are a 5-minute walk from the property. International breakfast is available on request. Guests are required to show a photo identification and credit card upon check-in. Please note that all Special Requests are subject to availability and additional charges may apply. Please inform Hotel Dolomiti in advance of your expected arrival time. You can use the Special Requests box when booking, or contact the property directly with the contact details provided in your confirmation. Swimming pool is closed from Fri 01 Nov 2019 until Sat 29 Feb 2020 Please note that breakfast is at extra costs. Located in Malcesine, Hotel Capri is on a lake, within a 15-minute walk of Palazzo dei Capitani and Consorzio Olivicoltori di Malcesine. This hotel is 17.8 mi (28.7 km) from Lake Tenno and 19.2 mi (30.8 km) from Lake Ledro.